David's Blog from the Creative Coast & Carolina Low Country! Savannah, Daufuskie Island, Hilton Head & Bluffton Life Style Information. Kathye Crayton on Forrest Gump! Alabama was filmed in Savannah and Beaufort! Jason Combs on A great time at our Book Release Party, a special moment. bigbonton on 145th Anniversary of the Battle of Fredericksburg, Savannah's Irish Prevail. Avast ye landlubbers and swabs. So ye thinks ye knows something about “Arrgh”. Well have ye a listen, lest ye find yerselves introduced to the sharks. Tis pronounced “Arrrr”. The “gh” is not so much as silent, mind ye, as tis the growlin guttural conclusion of a statement ye might find yerselves makin at a Tyburn jig. For the unfamiliar, that’s the wee dance at lo tide over the Thames River at the end of a rope, which no less than a few Brethren of the Coast have made. Rest in peace. Ar-men. But that’s not all there is to “Arrgh”. As it goes, even tho’ it be thought of as part of the general speech of pirates (aka “pyrates”), the term’s popularity is almost entirely due to one soul. Of 223 recorded instances of “arrgh” in film, television, and literature, all but 8 were the work of the two characters played by Robert Newton. Although he only uttered it on nine occasions as Long John Silver in the movie ‘Treasure Island’, by the time the 1952 production of ‘Blackbeard the Pirate’ was finished, he was up to fifty, more than once every two minutes. Now chatty it’s not, mind ye. For there be no less than forty-four different meanings for “Arrgh”. More than a couple include: affirmation, impatience, interest, pleasure, contentment, boredom, discovery, gloating, sympathy, dismissal, elation, imperative, triumph, command, calling attention, observation, deliberation, frustration, inquiry, surprise, gratitude, anticipation, relief, disappointment, sadness, anger, and disbelief. Economy, indeed, arrgh! Well, now that ye’re savvy about “arrgh”, there’s a place to be off to its make use, for tis the week of the 4th Annual Tybee Island Pirate Fest. Those unfamiliar with Pirate Festivals will be surprised to learn that the website http://www.talklikeapirate.com.links.html (Yes, there is such a site) lists no less than 36 pirate festivals running year round from Canada, up and down the Atlantic, Pacific and Gulf coasts, to Key West and the Caiman Islands, and from New Zealand to Sweden. Some festivals, such as the Pirate Fest in Tampa have achieved great notoriety due to their long existence, numbers of attendees and most especially, their degree of piratical pomp and circumstance. The people who affect the main attention for these events are aficionados, fans and historical re-enactors of all things piratical who have, with almost fraternal devotion to the subject, and at no small personal expense, assembled their own personal pirate outfits and personas that are often every bit as realistic not only as those seen in the theatre and on-stage, but in many cases true to the historical record. Yet, in contrast to other festivals and re-enactments, which are limited in subject matter or geographical breadth (e.g. civil war battles, Viking festivals, ethnic festivals, etc. ), pirate festivals - much like historical piracy itself, which spanned across vast global regions and affected many maritime nations and cultures for centuries - enjoy a following that crosses regional, national, global and ethnic boundaries and appeals to people of greatly varying walks of life. Such appeal is not surprising given the fact that much of what drew people to become pirates in the first place was the desire to throw off the bonds of authoritarian oppression and live freely, albeit shortly. At pirate festivals, it might be even said that the line between doing so and pretending to do so tends to become a little bit blurred. Beginning 6pm, Thursday October 9 at The Crab Shack, is the pirate costume party known as the Buccaneer Ball, where the King and Queen of the Pirate Fest will be crowned. There is also a costume contest for Best Pirate and Wench, and a chance at a treasure raffle for all attendees. ($20 in advance, $25 at door). 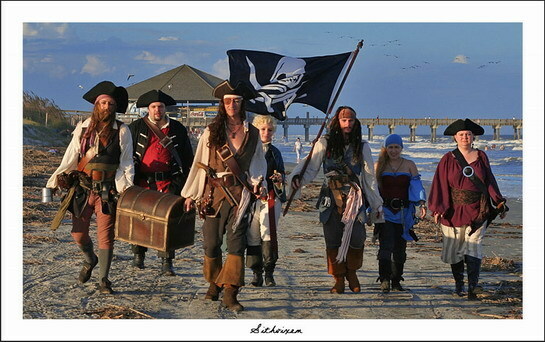 This weekend, 6pm-11pm, Friday, October 10 and 10am-11pm, Saturday, October 11 is the 4th Annual Tybee Island Pirate Fest. At 6pm Friday, the festival itself explodes with cannon fire from a pirate ship as pirates take the key to the City of Tybee at the South Beach Parking Lot. Friday activities include a Scavenger Hunt from 7-8pm with a $200 cash prize to the winning team (max. 4 persons/ team@ $5 entry fee each), The Thieves Market, Live Music by The Train Wrecks and Dikki Du & The Zydeco Krewe, and 6-8pm The Little Matey’s Cove for Children. Saturday events at the Pirate Fest include The Thieve’s Market, a Pet Costume Contest at 11 am (Registration 10-11am), Kid’s Costume Contest at 1 pm (Registration: 10-12 am) and an Adult Costume Contest at 4:45 p.m. (Registration: 10 am -2pm). The Pirate’s Victory Parade starts at 3 pm, beginning at Hwy 80 at 2nd Avenue down Butler Ave. to Tybrisa St. There will be live music all day by 300 Miles Band, Dikki Du & the Zydeco Krewe, The Bryan Clees Band, concluding with the main attraction – The Marshall Tucker Band 9-11pm. The festival website is http://www.tybeepiratefest.com . The Official 20-page bulletin for the event is found at http://buccaneersbulletin.com/bucaneers-bulletin.pdf More information can be obtained by calling Tybee Fest (912) 786-5393.